I bought this game as a package deal along with the Spectrum. It had been a long time since I owned a Gottlieb single-player EM. 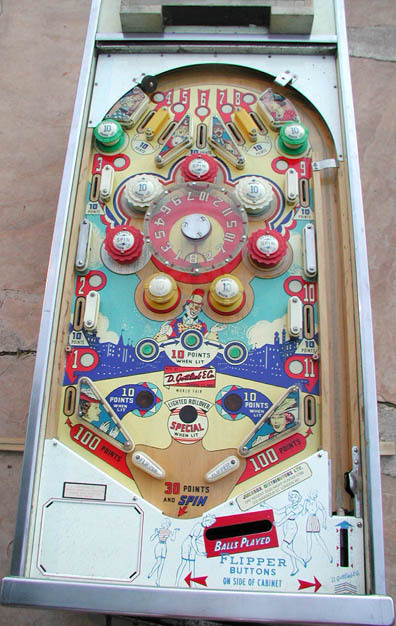 The playfield and backglass on this game were in great shape, but the cabinet was beyond hope. After inquiring locally for a week or two about the possibility of finding a replacement cabinet, I decided to just sell this one and recoup some of my money and sell. I was a bit surprised that I was able to sell it so quickly, so I guess I offered it too cheaply ($350 in August 2003). 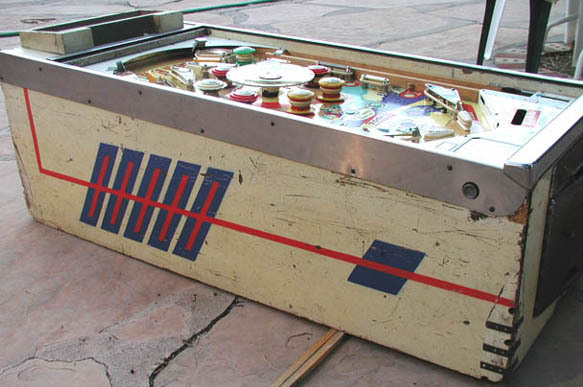 It was purchased by collector Pete Cooley in California, and picked up in person by his friend Reinhard Bangerter, who has one pinball design to his credit (Cactus Jacks). So that was kinda fun; we talked for quite a while. 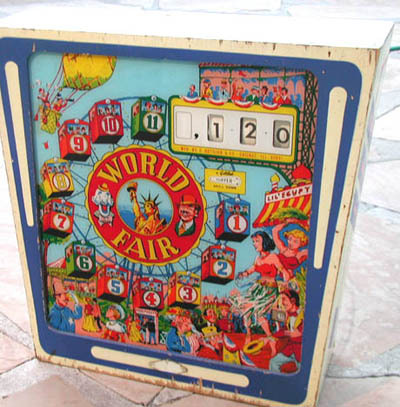 Here's the playfield. Some of the bumper caps needed re-inking, but everything is in pretty good shape. I had it set up in the house for only a couple of days, just to see if it worked. It started up and played, but had scoring and reset problems, and some minor switch issues. I didn't look into fixing the problems; I just tore it down and put it in the garage. The backbox is actually in pretty good shape, and didn't suffer from the same problems as the lower cabinet. The backglass is actually one of those European-style plexiglass glasses, so it had no peeling or flaking issues. Here's the ugly cabinet. The integrity of the cab is shot, so somebody screwed brackets right to the front left edge just to hold it together. Here's a close-up of that front corner. 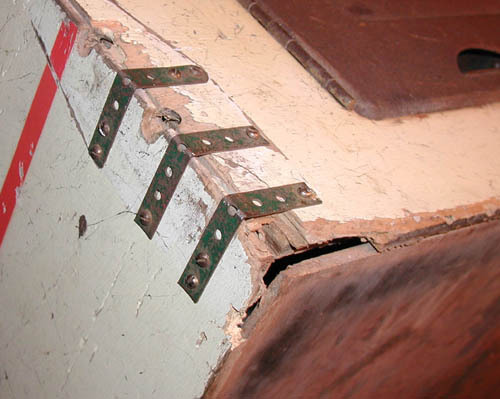 The wood of the lower cab had been infested with some sort of wood-eating insects, possibly termites. They didn't get into the head or playfield, fortunately. The rusty coin door also seemed to be a total loss.